The weather was beautiful here today. It finally feels like spring with 80 degree weather and the ability to wear shorts without freezing. The smell of BBQ has been all over my neighborhood as well. I absolutely love the smell of BBQ. There are few smells better than walking outside and smelling someone smoking ribs on a big charcoal side smoker. The weather and the rise of grilling inspired me to make burgers this week. There is something about warm weather and burgers that go hand in hand. My husband bought a huge charcoal grill about 5 years ago. However, this year it needs the rust to be sanded from sitting in our basement and my motivation has been lacking. Therefore I settled for making burgers on my indoor grill this week. Today I tried a new recipe for Burgers with Mozzarella and Spinach-Arugula Pesto from Bon Appetit. This recipe has 15 ingredients. It takes 30 minutes of total time, all of which is active and makes 6 servings. I did make a few changes to the original recipe. First I did two versions, one with homemade hamburger buns and the other with gluten free buns. I had one pound of beef that I had ground with chuck a few months back. I combined the ground beef with 3/4 pound of ground lamb. Since I was short on time I did not wilt the spinach. I often make pesto with spinach and never wilt it, I just puree it in the food processor in batches. For the burgers I ended up with a total of 8 burgers. 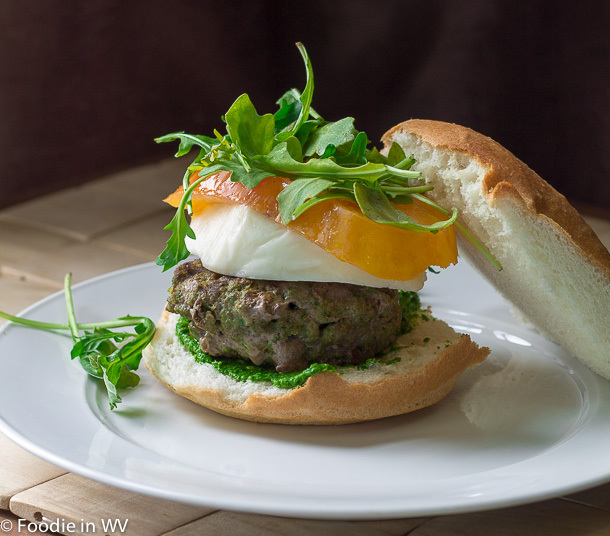 I like to keep my burgers on the small side, especially since they were blended with ground lamb which can be rich. For this recipe I used heirloom tomatoes. I love heirloom tomatoes, they are great with burgers. Make sure to salt the pesto and the tomatoes. The salt really helps to bring out the flavor of the tomato and the pesto. Blending the lamb and beef gave the burgers great flavor and my family really enjoyed these burgers. There was also enough pesto leftover to use on turkey burgers later in the week. 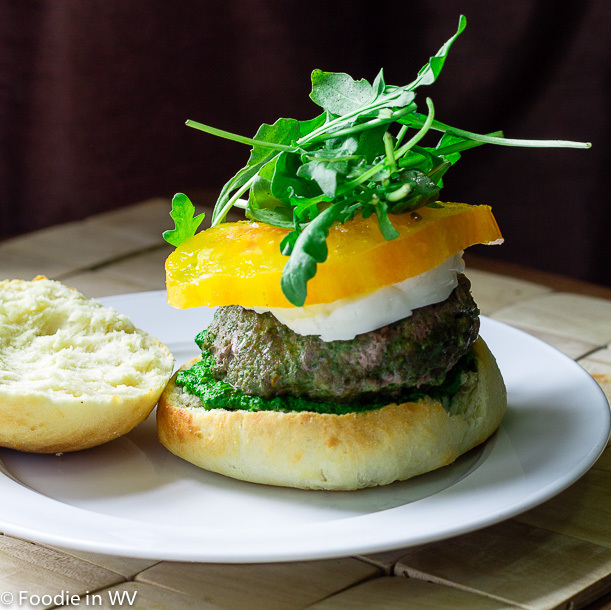 For the recipe go to Burgers with Mozzarella and Spinach-Arugula Pesto. I like the addition of the pesto. A nice change up from the usual burger routine. I agree the pesto is a nice change of traditional burger recipes. I'm not sure if my comment went through, but that seriously looks incredible! Thanks :) They really were good! Burgers are my favorite! I love that this one is a little bit different with the pesto on top. I've never had anything like this, but it sounds really, really good. We are big burger fans in my house too :) The pesto is different, but delicious! Look at the beautiful green color of your pesto and I like that you've used homemade buns! Can you make homemade gluten free buns? I'm just curious. I'm probably one of the few people who hasn't tried gluten-free yet, so since you had both I was wondering if it was possible to make them and have them taste as good as the others. You can make homemade gluten free buns. I make all my buns homemade. However, I can honestly say that gluten free baking takes getting used to. It never tastes exactly like the gluten counter parts. They can still be good, you just have to adjust your thinking a little bit :) I wish that I could eat gluten, but genetics have a different idea! Love burgers and love pesto. I am on a plane right now and starving! I love burgers and pesto too :) I hate flying! Oh, gosh, these photos are making me drool! I love the idea of pesto on a burger. And those tomatoes are gorgeous! Great recipe. Thanks for sharing! Thanks :) I love heirloom tomatoes, they are great! These look wonderful. Thanks for sharing on Foodie friends Friday. Thanks :) They really were tasty! Thanks :) It really is great! Thanks for the heads up, going over now!